To the Southern side of Sweta Prabhaava Vishnu in Kanchi Mandala was the Sacred Presence of Gayorahana Shiva and to the latter’s West was Kanyakeshwara Shiva . Kailaasanatha Shiva was placed to the North of Kanyakeshwara. In the center of this Square -at the Vayavya of Kanchipura- was ‘Rudra Shaala’ where there was a powerful Shiva Linga whose ‘Archanaabhisheka’ was stated to bestow the fruits of Koti Lingarchana and that was why this Shiva Linga was called Rudra Koti. Nearby the Rudrakoti and Gaayaadhirohana Shiva was Vikata Ganapati who in the past gifted Suradshana Chakra to Vishwaksena and almost adjacent to Vikata Ganapati was a Rasaala Vriksha and underneath the Tree was Shanmukha Deva; Maharshi Markandeya claimed that it was under that Rasaala Vriksha he attained ‘Sangjnaata Jnaanatwa’. In the Eastern Side of the Rasaala Vriksha was Pralaya Bandhini Durga as she brought Ganga River under control. To the South of Pralaya Bandhini was Sampatkari Durga who out of consideration for Rishis killed Gajasura. Nearby Sapatkari was Renuka Durga who bestowed an eye to Vipra named Jambuka in the past. A little far from Renuka Durga was Veera Vareswari who mitigated the anger of Veerabhadra after destroying Daksha Yagjna. Gayaadhihorana Shiva rewarded the boon of ‘Sasharira Swarga’ or Entry to Swarga along with Mortal Body to King Yayati while Jwara Hareshwara provided relief from ‘Maheshwara Jwara’to Devas and Rishis. Anekapeshwara Shiva gifted Vajraayudha to Mahendra to kill Vritraasura and Kailasa Shiva granted Kailaasa Nivaasa to King Tundeera in the past. Paschimeshwara saved Vaalakhilyas from their fright of Rakshoganaas. Vishweswara Shiva was the only Deva who could absorb from Ganga of all the sins of those who bathed in her. Dounakanteswara rewarded ‘Khadga Shulas’to ‘Douna Kantaas’. Smashaaneshwara enabled his own Shakti Lalitambika to kill Bhandasura. To the Nirruti of Smashaaneshwara were Pandava duta Krishna, Chandrageeva Madhava , and Sweta Varna- alll of Janaardanaamsha. Pandava Duta Krishna sought peace from Kauravas before Maha Bharata Yuddha, Chandragriva Madhava wore Chandra dyuti around his neck and Sweta Varna was illuminated by Chandravarna Daitya in darkness. 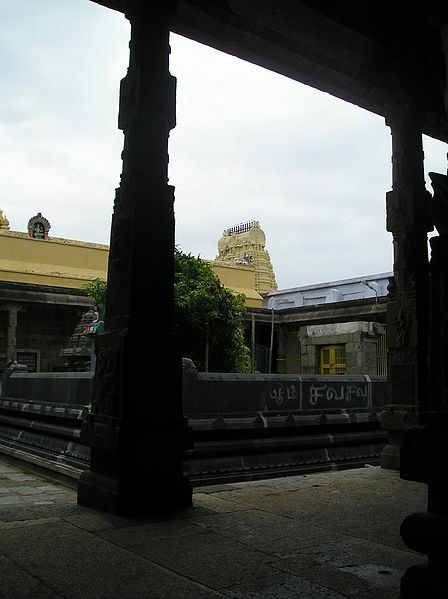 From Sweta Varna Janardana towards Ishanya was the abode of Choraikaamreshwara where interestingly Rudra assumed the Form of a Thief before manifested himself as a Shiva Linga! Markandeya Maharshi was also installed as a Vigraha as per the instruction of Maha Deva himself! To the north of Markandeya was Elaalaka Ganga sharing Shiva’s ‘Ardhaasana’. 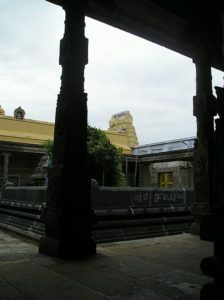 Dhavalaikaamra nayaka near Choraikaamreshwara viewed Ganga and assumed a Linga Swarupa, adjacent to whom was Veerabhairava as ‘Smashana Paalaka’ or the Sentinel of Smashana under Shiva’s instruction. There was a Ganga Tirtha to the Vayavya of Virabhadra even a mere touch of its waters would fetch Shambhu Loka; Devi Parvati granted a boon that ‘snaanaas’ in that Tirtha on Mondays would yield Jahnavi Snaana Phala. There was also a Mangala Tirtha to the Agneya direction of Ganga Tirtha and Kuja Deva secured relief from his Agni Swarupa and as such Kuja Deva gave a boon to all those taking bath in that Tirtha on Tuesdays would secure the Punya of Saraswati Snaana. To the Nirruti direction of Mangala Tirtha was Jwaraha Tirtha where Munis and even Devas used to take baths in it and those persons who bathed in it would be blessed with Kapila Tirthga Snaana. There was also a Pandava Tirtha towards the Vayavya of Jwara Tirtha where Bhagavan Krishna endeared Pandava Brothers and mutually resolved a Friendship Pact; mere darshana of the waters would destrory one’s sins and ‘Sparsha’ (touch ) would secure Shambhava Loka while bathing during the Roudra Nakshatra provided ‘Krishna Nadi Snaana Phala’. Thus in this Sacred Place of Ekaamreshwara there were the presences of a Vighneswara in the Rudra Shaala, Skanda, four abodes of Durgas, Eight Shiva Murtis, Three Vishnu Murtis, Five Mudras, and four Tirthas as per Shiva’s instructions. Kanchipura Vayavya pradesha was stated as Bhu Kailasa by Rishis within which there were five glorious Places viz. Rudra Shaala, Rudra Koti, Kailasa, Ekaamra and Maha Smashaana. A person spending even a minute in the Rudra Shaala would be relieved of all kinds of sins and could be identified as a human being with ‘Shivaamsha’; in the past, several residents of this Kshetra were stated to have completely avoided even the visuals of Naraka Lokas and excelled in ‘Shambhupada’.